Mangrove Cay hires guides for whom guiding is not only a profession but for whom life on the flats of Andros is a way of life. Our guides have grown up on the waters we fish and will provide you with an educational, enjoyable day on the water. We understand that the history of saltwater fishing guides can be a bit mixed and accordingly have hired guides that will be kind, patient, and skilled. Our guides have been hired because they know the flats and the marine life of Andros, understand the weather and tide patterns on Andros, have exceptional eyes with an innate ability to spot fish under all light conditions, and, most importantly, are skilled and safe boat handlers. We chose them for these attributes in addition to their character, personality, dependability, willingness to work hard and be a cooperative member of a team. Unlike some lodges that bring guides from the US to guide on Andros, we feel it is very important to hire guides from the local community. 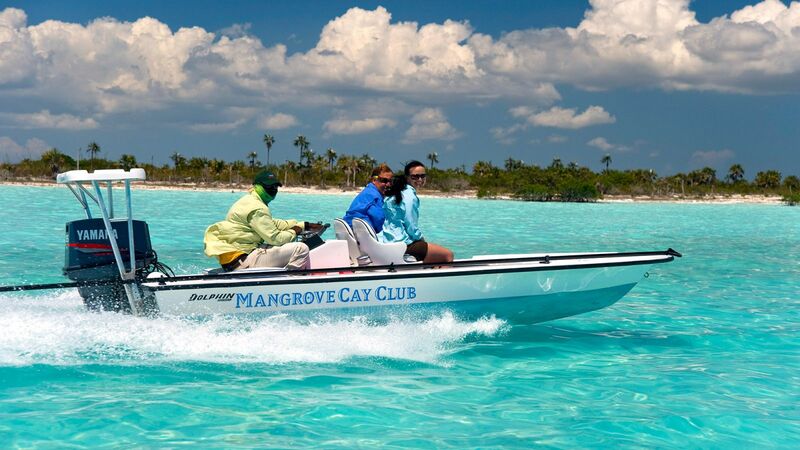 Having the local community benefit from the income derived by Mangrove Cay,builds a constituency for protecting bonefish and creates a stronger connection between sustainable economic activity and the community. Our guides are, above all, professional, and we feel can provide you with a day of fishing that is unique and an important part of a bonefishing experience in the Bahamas. All of our guides are Boat Captains, licensed by The Maritime Authority of The Bahamas and trained in safety measures. They are all fly fishermen and that enjoy fishing. Guides at the Mangrove Cay Club work on a rotation so you can enjoy the opportunity to fish with several members of our team during your stay. Safety has always been our number one priority at Mangrove. Accordingly we operate 16’ Dolphin skiffs with Yamaha 85 hp engines to address our need for mobility, comfort and safety while traveling from flat to flat. We have 10 skiffs: 8 on the water and the other 2 are backups. All of the boats are configured with elevated poling platforms and have fittings on the casting deck for a removable leaning bar. Two boats also have a fitting for a removable cushioned chair on the casting deck. For safety, our boats are steered from a console to give the guide more control than can be had from a tiller. Every boat has a kill switch on the console and all guides wear a lanyard connected to the kill switch when running. If for any reason, he loses his position at the wheel, the engine stops. Additionally, all of our guides wear a GPS Spot (personal locator) which allows the guide to communicate with us and transmit his GPS location in the event of a mechanical breakdown or emergency situation. In front of the console, there are two cushioned captains’ chairs. Decks are clear and free of obstacles that could snag a fly line and there is lots of dry storage space. Rods are held securely in rod holders alongside carpeted gunwales and there is space for 4 rods. We have a full time certified Yamaha mechanic on staff to perform regular maintenance and for any needed repairs to our engines and a fiberglass man to keep our boat hulls in pristine condition. Fly rods and reels can be borrowed. We have 8# and 10#. Spinning rods and reels for bonefish, barracuda and sharks. Note: Equipment is loaned free of charge. However,to offset shipping costs, there is a $200 per rod fee and $100 per reel fee for damage to any equipment than needs to be returned to the manufacturers for repair. Flies, fly lines, leaders, tippet spools, extra backing, Mangrove Cay Club caps with logo, logo T-shirts, Mangrove Cay Club logo fishing shirts, Polarized sunglasses, Sun screen Insect repellent, Bait, some lures, Buff headwear sun protection There is also a fly-tying table with materials for you to use.